j. ellen Design, LLC provides a full range of commercial and residential interior design services. We are based out of Manchester, NH with studio space in the Historic Millyard. We are passionate about interior design and are dedicated to working collaboratively with you to help you organize your ideas to make informed design choices for your home or business. Our goal is to provide expert guidance through the overwhelming array of options presented by a project and specialize in kitchens, remodels, new construction and commercial office space design. We strive to meet the needs and budget of each individual client while maintaining functionality and the integrity of your vision. j. ellen Design, LLC works closely with clients and their architects, builders and other trade professionals to create beautiful, comfortable spaces that reflect each client’s personality and lifestyle. From rearranging and repurposing existing pieces to give you a new perspective on old materials to starting from a blank canvas and cultivating your dream space, j. ellen Design, LLC will meet your interior design needs. 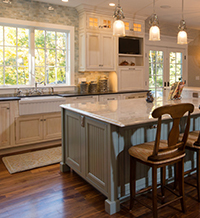 When a client chooses j. ellen Design, LLC, many come in with a definitive vision for their interior design project. It is our job to elevate those ideas and bring them to life in the client’s home or business. And for the client whose visions are not yet fully realized, we can help focus your ideas and develop a plan to best suit your needs and taste.